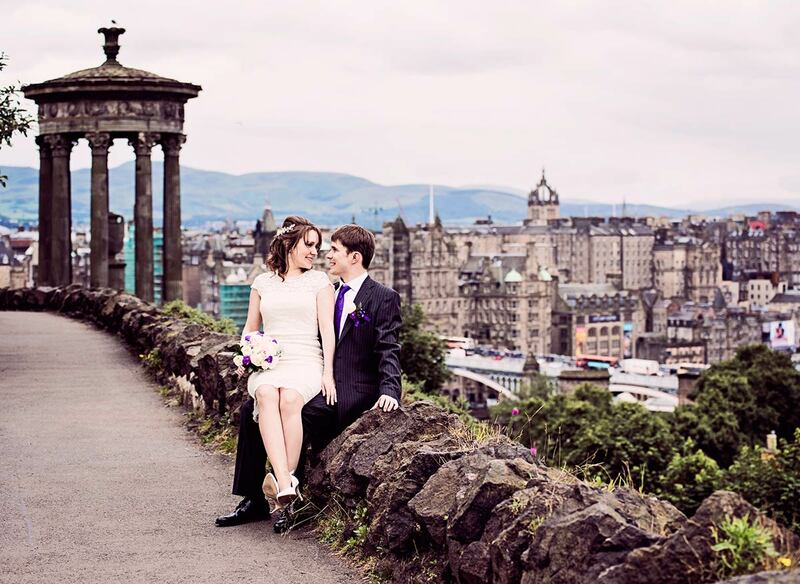 Every year, almost 3,000 couples choose Edinburgh as their city of love for their wedding. 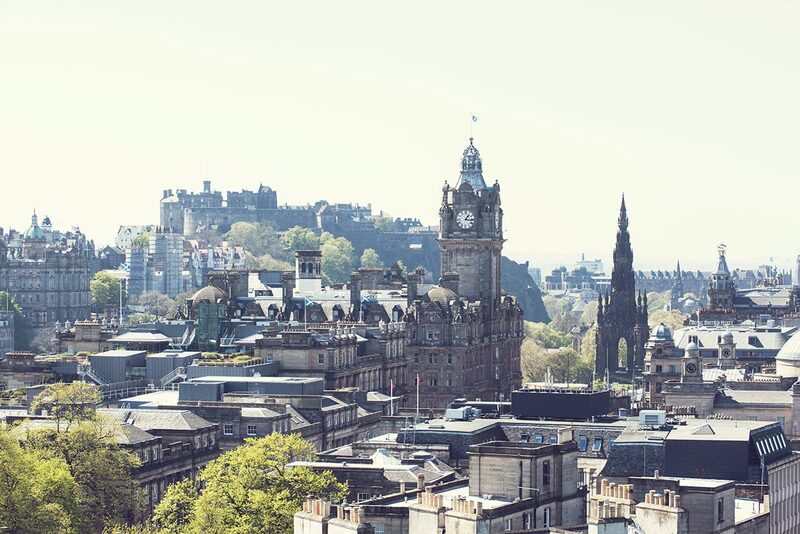 Edinburgh is the second-largest city in Scotland and is full of charm, history, amazing architecture and green spaces, as well as outstanding wedding venues. Regardless if you are eloping to Edinburgh, eloping to Scotland, or you call Edinburgh your home - you can find a wide range of quirky outdoor venues, caves, boutique hotels, roof-top venues, luxury hotels with amazing gardens and so much more. So it is only natural that it is one of the most popular destinations for couples to celebrate their weddings in Scotland. 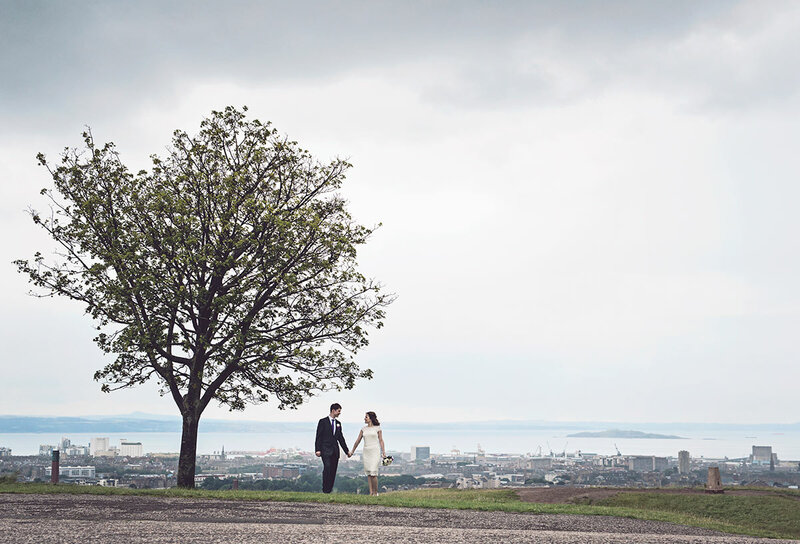 After more than 10 years as a wedding photographer in Edinburgh, I have worked in many different venues and had some interesting experiences in this great city. In this article, I will shed some light on a few things worth considering for your Scottish capital wedding. City centre venue - where to take photographs outside? There are certain times of the year during which Edinburgh is super busy. 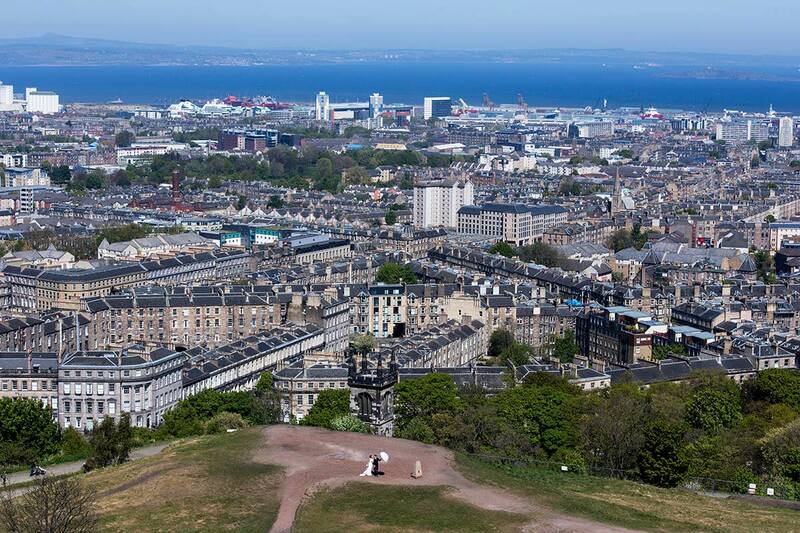 According to UK Government statistics, Edinburgh - after London - is the second most visited city in Great Britain. There is the Edinburgh Festival period, usually starting in July and lasting until the end of August, and then there is the Christmas period too, pretty much all of December. The other times of the year, Edinburgh will still be busy with tourists, but outside the festival period, you can take amazing photos in the Royal Mile, of pretty much empty streets after 6 pm, whereas it’s mayhem at 2 pm with lots and lots of tourists. 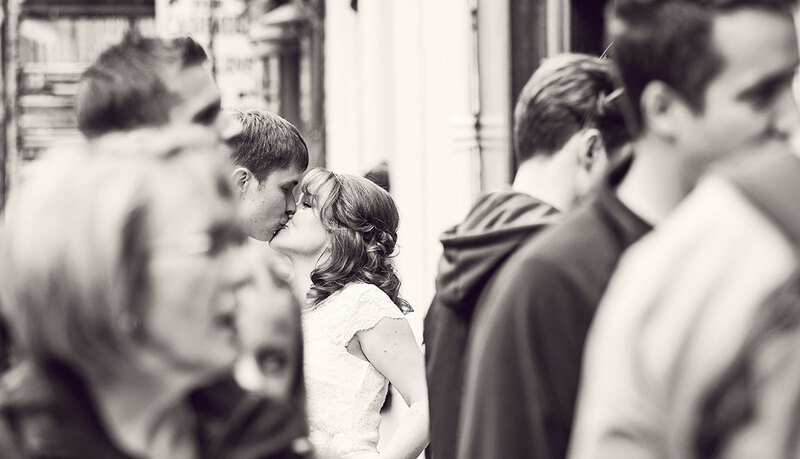 I photographed a wedding at a Royal Mile venue during the Festival period a couple of years ago and the couple had envisaged photographs in the old streets, but we were surrounded by hordes of tourists during the romantic photography time. People were following us around with selfie sticks and gave us no space whatsoever. This can be distressing to the couple, so it’s best to think about this beforehand. A photograph of the couple, looking through the crowds. Most venues have two different price lists for their venue hire/room hire: out of season and peak season. Both packages will provide pretty much the same thing, however, the price will vary considerably. Peak season tends to be April - September, and includes mostly weekends, i.e. Friday, Saturday, Sunday. Most venues also include Christmas in their peak season, as well as Easter. Low season tends to be anything in-between, but sometimes also weekdays during the summer months. The advantage of having a city-centre wedding is that all your wedding suppliers can be on your doorstep. These can include your hair and make-up professionals, florists, your celebrant, kilt hire, wedding-cake designer, venue-dressing service provider, car hire, a wedding band or a DJ, wedding pipers, photographers, you name it. The selection will be huge, but it also can make it harder to choose. Also, a lot of the established wedding suppliers will be booked up months, if not years in advance, so it’s recommended to get in touch with your suppliers as soon as you have decided on your wedding date. In Scotland, legally, you can get married anywhere you want. You do not need to get a permit to get married on the beach, for example. 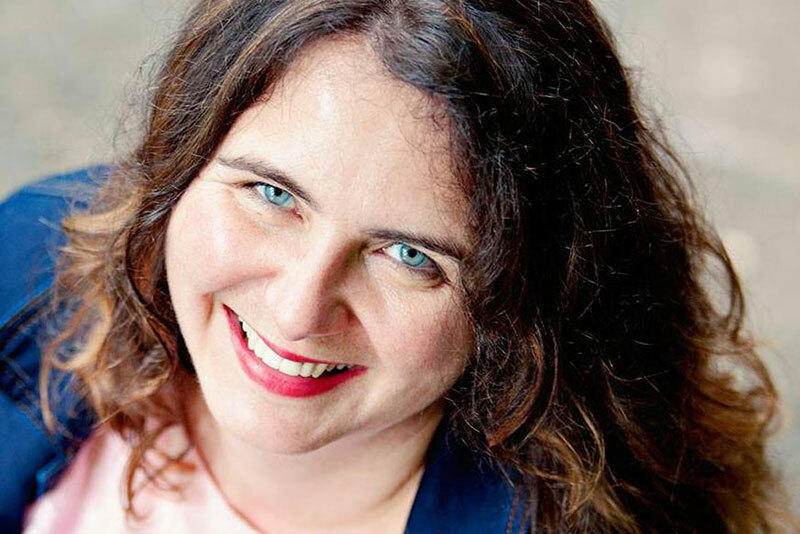 You just need to arrange a celebrant (humanist, registrar, minister, interfaith minister) to come to your chosen location, pay them a fee and you can get married in your favourite spot. But please check that your favourite bit is not on some private land, or in a park maintained by the local authority. You may need to get permission from the land owners to have your ceremony at their location. If you are getting ready at a location different from your wedding venue, plan a little bit more time for the car, or a taxi to take you to the ceremony. Traffic can be very busy in Edinburgh at the strangest of times, so always plan a bit extra and do not call the taxi when you are ready to go, but have it arranged and waiting for you. I have been in a few situations when the bride tried to arrange a taxi - she was ready to walk down the aisle and had to wait for 20 minutes as no taxi was available. Please note that your celebrant will want to speak to you before you walk down the aisle. They usually check that the details on the marriage schedule are printed correctly. This all takes a little bit of time, so please plan for this. If you want to be fashionably late, it’s best to be on time, as after the chat with the celebrant you will be a little bit late. Some city-centre venues do not provide parking for their guests, and it is even difficult for some wedding cars to wait outside the venue during your ceremony so that you can have photos taken after. They might have to drive off and come back due to traffic constraints. This is just something to bear in mind and check with your venue. A few days before your wedding, check the local traffic situation. For example, during festival time, there is hardly any vehicular access to the big venues in the Royal Mile, such as the Signet Library. The place outside St Giles' Cathedral is used for stalls and performers, whereas outside the festival time, it’s pretty much always empty for cars to park during the wedding ceremony, and for busses to drop off guests. However, the parking spaces are limited and you need to book your space with the Lothian Chambers or the Signet Library. City-Centre Venue - where to take photographs outside? There are many city-centre venues that do not have a garden or a private outdoor space where either your guests can enjoy an outdoor reception during the summer months, or where you can escape from the reception for your romantic wedding photographs. The amazing Balmoral Hotel, for example, on the east end of Princes Street, offer the bride and groom access to their roof top - just underneath the famous Balmoral clock. It’s quite a large area, and you can enjoy fantastic views over the Old Town, Edinburgh Castle, as well as Arthur’s Seat. And there is no one to bother you; no people walking between your photographer and you during the photo session. However, as the hotel is located on one of the busiest roads in Edinburgh - Princes Street, there are not many options for going for a walk with your photographer. The same applies to venues up and down the Royal Mile, including Edinburgh Castle. So what is the solution? Go green - but get a wedding photography permit! 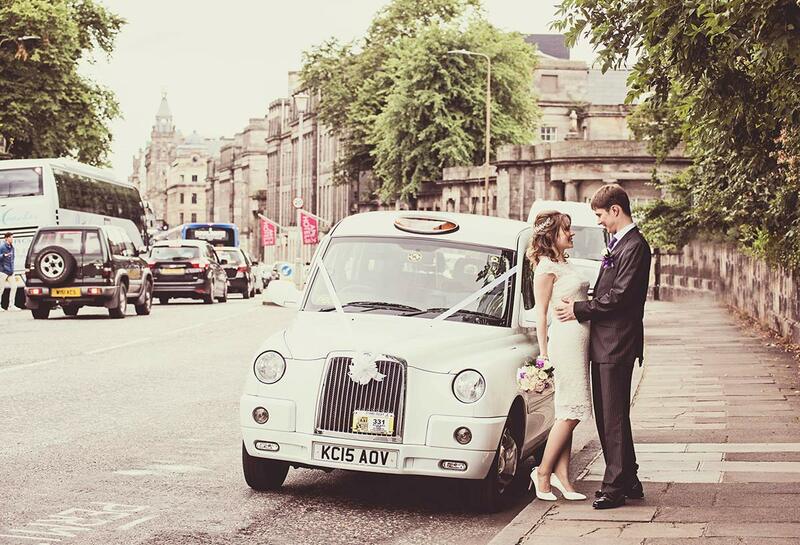 If you are keen to have your wedding photographs taken outdoors, you could pre-hire a taxi, such as one of the cute Edinburgh taxis. 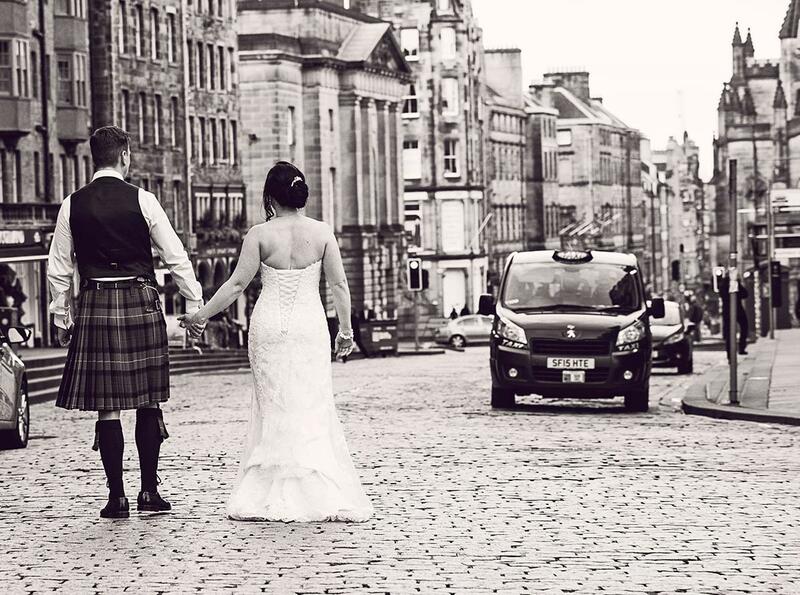 The Edinburgh City Cab Company has access to a few white cabs which look amazing as a wedding car and are an alternative to classic wedding cars. If you are planning for your wedding transport in a classic car from your home to the venue, then they might be able to provide transport for you to your chosen photography location after the ceremony. The photographer might even be able to join you in the car, saving them finding a parking space. What you need to bear in mind with public places in Edinburgh, such as the Royal Mile, Calton Hill, Princes Street Gardens - there will always be a lot of people around. And I mean A LOT. So the best thing is to speak to your photographer who is hopefully equipped with local knowledge and can suggest the best locations and timings for you on your wedding day. 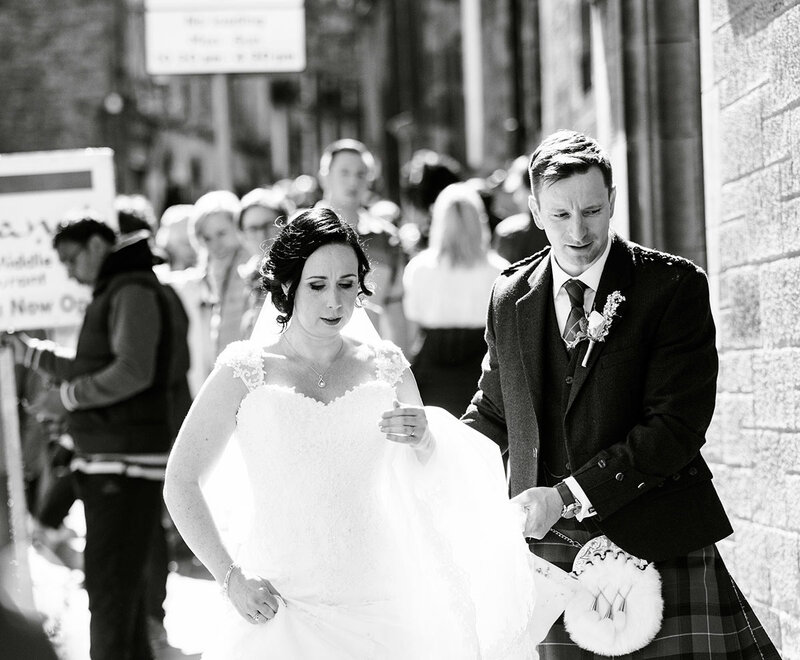 Also see this article I wrote about Wedding Photography Permits in Edinburgh. The above photograph was taken around 4 pm in the Royal Mile, Edinburgh. I am often asked by my customers, if we can go up to Edinburgh Castle and take a few photos in front of the Castle. This is not possible, unfortunately. Unless your wedding takes place in Edinburgh Castle, they do not allow professional photography on the Castle Esplanade - the place outside the castle. Never. They will not allow it. And you cannot obtain a permit for it either. If you are dressed up for a wedding in a white dress and kilt and it is obvious that you are a bride and groom, security guards will stop you accessing the esplanade. That’s their rules, and I suppose the main reason will be that other people will flock towards you and want to take photographs too and there might be a safety issue. So if you are keen for a photograph with Edinburgh Castle in the background, it might be best to get a permit for Princes Street Gardens. 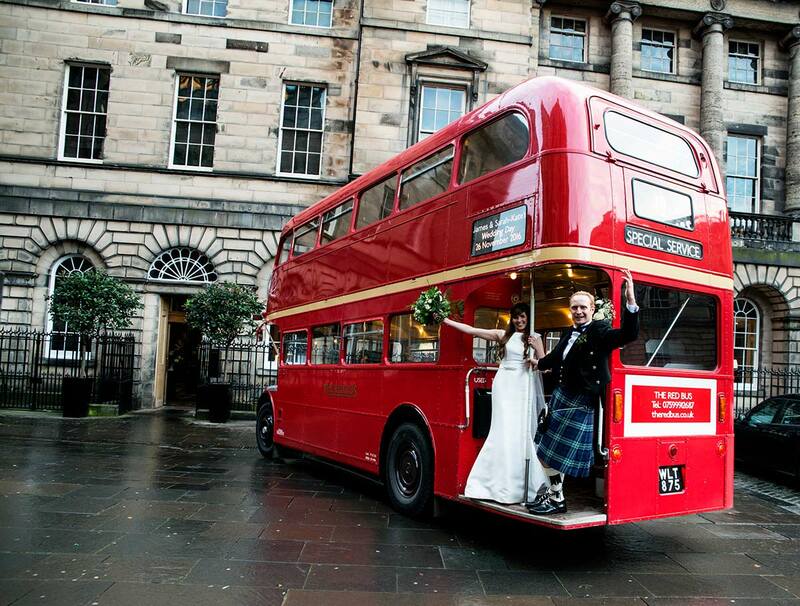 Edinburgh is a wonderful city to visit and offers everything you can think of for your Scottish dream wedding. Take the time and visit Edinburgh if you are travelling from abroad to sample all the different options, view venues, try the cakes, check out florists and speak with photographers. And if you have any burning question that I have not answered - send me a message and I will hopefully be able to provide more information as time goes on.